The sailors of dock landing ship Comstock’s deck department think their cruise video is better than the cruiser Normandy’s. On Tuesday, we posted a video made by the sailors on Normandy that included go-pro video of small boat ops, a sweet F-18 flyby and 5-inch gun blasts. Two sailors from Comstock wrote in with links to their own deployment video, pieced together by the seamen and boatswain’s mates of OD Division, claiming superiority. The Comstock returned to San Diego in late February from a 7-month cruise. We checked it out and it definitely gives the Normandy a run for its money. V-22s, SH-60s, time-lapse videos of vertical replenishment, underway replenishment, dropping anchor, and dancing boatswain’s mates — all set to an up-tempo beat. 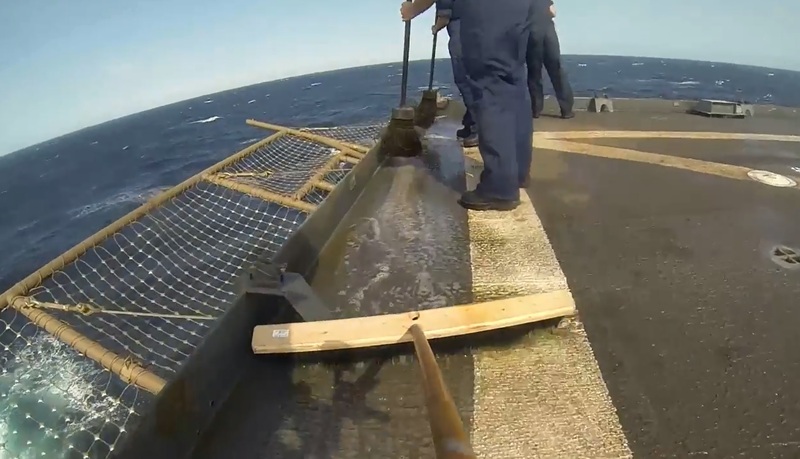 It also features some humor, mixing in cuts of sailors goofing off in the berthing, needle-gunning and sanding, and even that most tedious of tasks: sweeping standing water. Bravo Zulu, Comstock. Your video editing skills and dedication to topside preservation reflect great credit upon yourselves, and are in keeping with the highest traditions of U.S. military deployment videos.